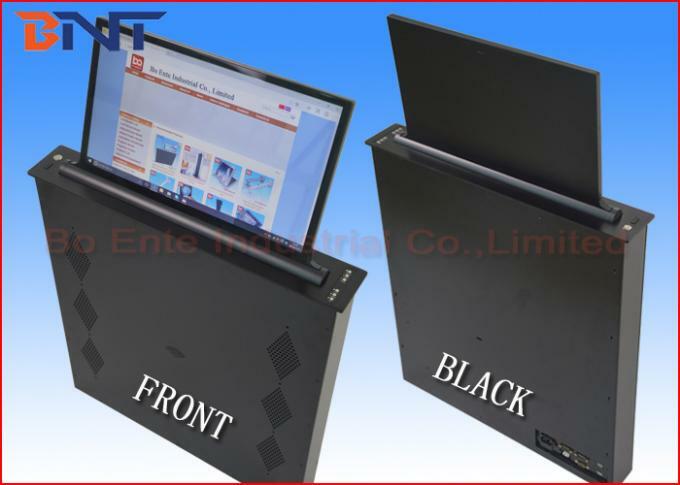 LCD monitor lift is a motorized lifting mechanism integrated with 17.3 inch FHD wide touch screen. 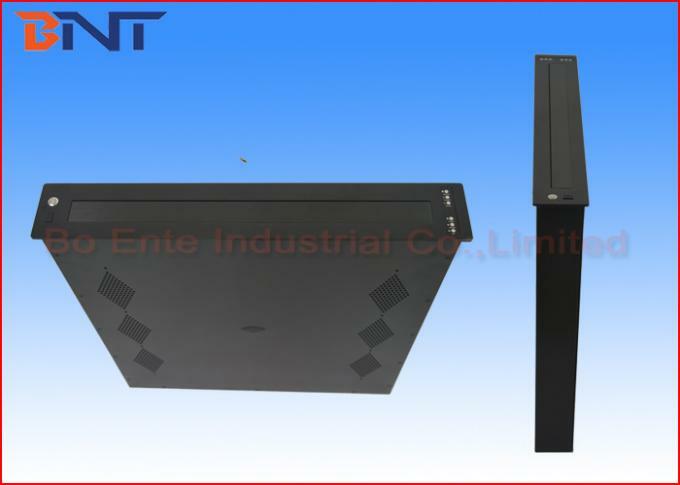 It’s a ultra-thin design complete hidden equipment for audio video conference system. 1980*1080 high resolution screen with aluminum alloy brushed shell. Monitor could arising up to the tabletop if user would to present information by wireless controller. Monitor could coming down into the table downside if finished meeting. LCD/LED monitor could tilt 45 degrees automatically by pressed the button, and also could return back straight as required. Its 8.8cm width make whole equipment smarter than normal LCD motorized lift. Integrated with17.3inch FHD screen provide a complete monitor lifting issue for conference audio video solutions. It could be controlled by wireless remote, or touch switch on panel, or Crestron central controller, wireless automatically system. All Lifts with monitors could be motorized raising up and overturn 20 degree automatically a the sample in group. It realize all audio video solution become paperless office conference system. 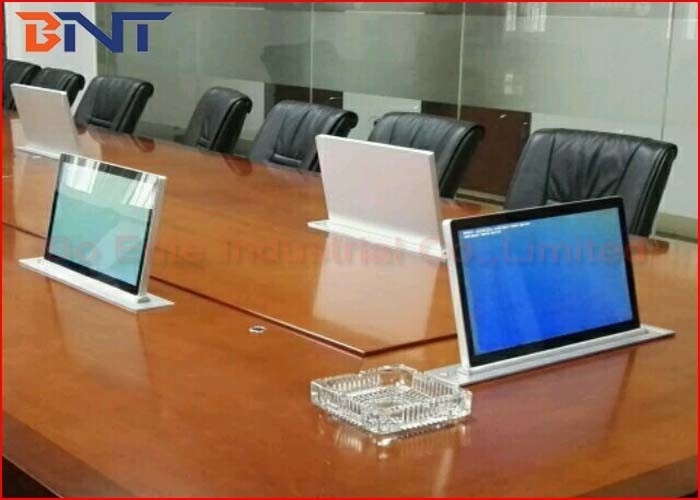 1, Screen could be electrical overturn 45 degree angle for more prefect presentation. 2, Made of aluminum alloy panel and monitor shell, adopt imported circuit board, synchronous motor,and gear & rack. 3, It’s smoothly and quietly during monitor lifting. Low noise which less than 30db. 4, Whole complete lifting equipment with 17.3 Inch FHD wide screen. 5, Circuit board make motor working to bring gear lifting monitor up with rack. Supply the most steady and safe during monitor lifting up and down. 6, Monitor would be power on automatically if reach desktop and power off if arrived the bottom. And power off automatically if reach the bottom. 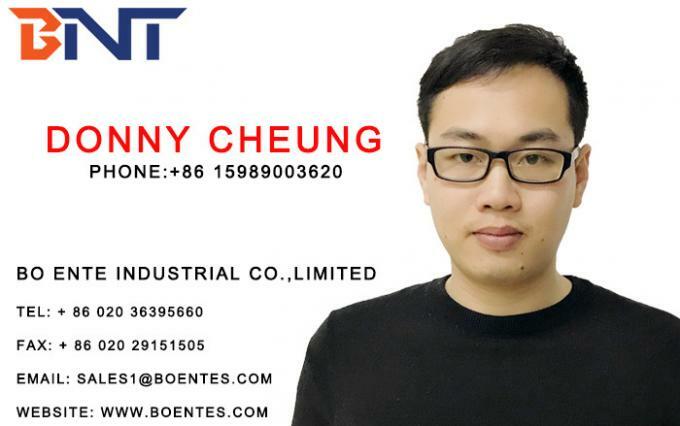 7, Ultra-thin Design, only 88mm width of whole product, Monitor is 10mm thickness. 8 , Adopt double powerful motor, one motor to made monitor lifting up and down, another motor and monitor tilting 20 or 35 or 45 degree angle and back.